Are you looking to add border to your images in Blogger? Sometimes adding border to images can make them standout in your content. 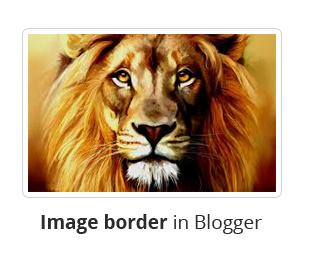 Recently, one of our users asked us how to add border around an images in blogger. Though, it is very simple and can be done easily but new bloggers find it difficult. In this article, we will show you how to add border around an image in blogger. To add border around images you need to write simple codes of CSS. With these codes you can easily add different kinds of borders having any colors that you want. In the above code you can change the #d2d2d2 with any other hex color to alter the color of your border. You can also increase the above 2px to a higher number to increase the blank space arround the border. Once you are done customizing your image border, press the "Save Template" button present at the very top of your screen. We hope this tutorial may have helped you in learning how to add border around an image in blogger. Though the technique is very simple but still for beginners it might be a very tough task. However, share your thoughts below and also share it on Facebook, Google+ or Twitter. Thanks! Looking for this. Other bloggers giving so much code.